Successfully Added 7 Inch TFT PMP - HDD Memory + DVB-T Receiver to your Shopping Cart. 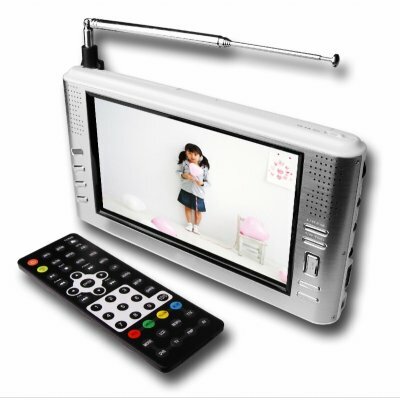 The absolute ultimate PMP with incredible features included a super large 7 Inch TFT Screen, up to 160GB memory from the 2.5 Inch Hard Disk enclosure and even a TV receiver for playing DVB-T and Analog TV. There is so much that is right about this system: it will do everything you want and more. DIVX (above 4.0), XVID, MP4, and AVI formats will all play natively at 720x480 and 30fps, AV IN and all TV programs can be directly recorded at high resolution in DIVX format, it includes a multi-memory card reader, and blasting sound from the 2 x 1.5W speakers. Perfect for hard to please gadget freaks, and even in the car with the screw mount for watching in the front. Everything that anyone could possibly want from a PMP is easily available at a low wholesale cost and with no MOQ at all from Chinavasion Electronics. Important Note On DVB-T:Digital TV standard DVB-T is not available in every country or region. Please make sure to see if DVB-T is available in your region.. Install h. disk and then connect the 7 Inch TFT PMP on pc via usb cable. Format HD to fat32 system. Nice picture, but does anyone know how to format the disk so it is readable?